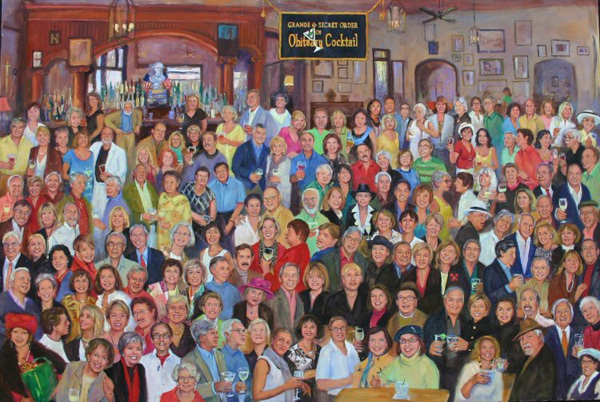 Fredrick Guess has just completed what may be his most extravagant work yet – a group portrait of the Obituary Cocktail gatherings. It took more than a year, but he has compiled more than 150 individual portraits of Obiters into one painting. To our knowledge, this is the most comprehensive painting of French Quarter friends and neighbors ever produced by an artist. It represents, for the first time in history, a view of who lives, loves and cares for the French Quarter. In preparation to do the painting Freddie Guess attended Obit gatherings for several months to take photos of the group and individuals in attendance. Many of those pictures are now preserved for all posterity in oil on a 4 foot by 6 foot canvas. Prints will be available at an unveiling for which the date, time and place is yet to be determined. These collector’s items will be limited to a single run of 300, each signed by the artist and serially numbered. Three artist proofs will also be available. The prices are $75 per print and $100 per proof. Sales and prepaid reservations can be made by calling Fredrick Guess in his studio at 504.581.4596. This massive undertaking is a real part of French Quarter history in which our generation has had the opportunity to take part. The prints and proofs are very limited and will be sold first come first served. Buy one for yourself and one for a friend and they’ll make great Christmas and Hanukah gifts, too. If anyone in Obituary Cocktail is associated with or knows anyone with a museum that might like to display the original please have them contact John at john@j-km.net. This painting is a part of French Quarter history.